Freshwater fish for pond and lake stocking, fish food, pond care products, and aeration options. Click to check out what's in stock and current news. Fish Haven Farm is a family-owned and operated business that has provided freshwater fish for stocking ponds, lakes, and streams since 1981. Our public facility on Route 96 in Candor, New York opened in 2001 to create a centralized location for fish sales and distribution. Fish Haven Farm is a supplier for Soil and Water Conservation District programs in New York and Pennsylvania. Through the years, Fish Haven Farm has added several pond care products to assist our customers in improving pond water quality. As dealers of Kasco Products and Outdoor Water Solutions, we sell a variety of electric, wind, and solar-powered aeration options. Fish Haven Farm is happy to provide customized information and recommendations to individuals, lake associations, or other organizations. Fish Haven Farm strives to reduce its environmental impact and promote green business practices. The natural waste from our facility is sent through a series of ecological filters before returning to the environment. Tank water is stored in a silo, using less energy to pump the high volume of water needed to support our thousands of fish. 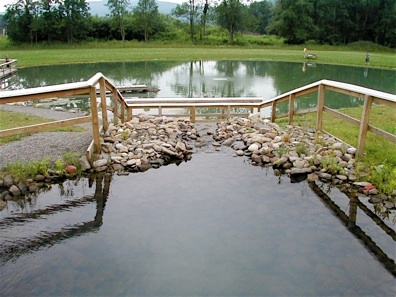 Natural pond ecosystems, free from harmful chemicals are encouraged. All of our pond products are non-toxic. Pesticides and herbicides are not sold. We prefer biological control of pests and weeds with aeration, beneficial bacteria and combinations of fish species that work in conjunction with one another. Most of our fish species are common in the northeast and encourage healthy ecosystems. The surface area of the body of water is an important piece of information that a pond owner should have in considering pond management decisions. Appropriate fish stocking rates, pond care treatments, and aeration options can be impacted by a more accurate measurement of the pond surface area. Here's an easy way to calculate the approximate surface acreage of a pond using Google Maps. 1. Enter a nearby address of the pond. Click on Satellite view in bottom left corner. Navigate by scrolling to locate the pond. to make them more precise. this by 43, 560 to get the approximate surface acreage of the pond. The pond is a little over 3/4 acre.